I've had many excellent meals in Japan, but the one meal that really made me drop and blew my mind away was this tempura course meal at Tsunahachi. 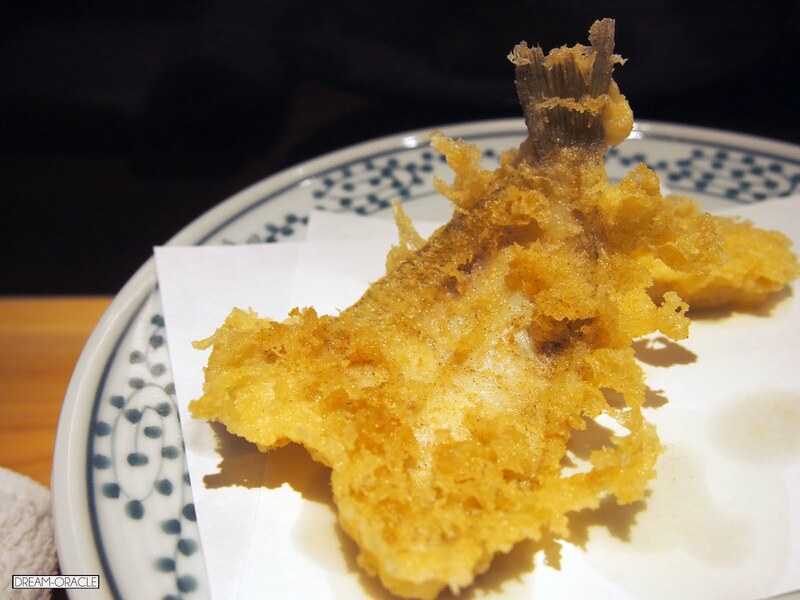 I love tempura and pocket-friendly good tempura places are hard to find in Singapore, so imagine how happy I was to realize Tsunahachi has a accessible branch location at Takashimaya Times Square! Now I don't have to travel to their main shop! I went to Tsunahachi for dinner so the menu somewhat differs from their lunch. During dinners, they offer 3 types of course sets, and since I have no idea how it works, I went for the course set instead of ordering ala carte. Boy, am I glad I decided on the course set. Tsunahachi's menu differs slightly from branch to branch, and it also depends on their catch of the day. But if you order a course meal, you can expect a cold tofu appetizer, prawn, fish, seafood, vegetables, a cold pumpkin soup and to finish off your meal, a choice of tendon or ochazuke. Don't worry if you can't read Japanese menu, there's an English menu as well as an instructional page with diagrams to show how to eat the tempura. I didn't really bother to follow closely and just experimented any way I liked. 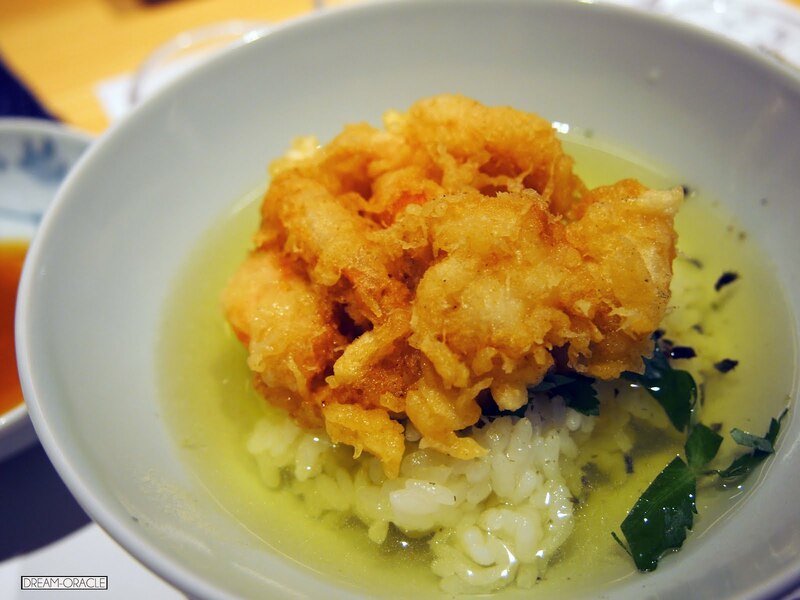 Green tea salt is the traditional accompaniment to tempura. 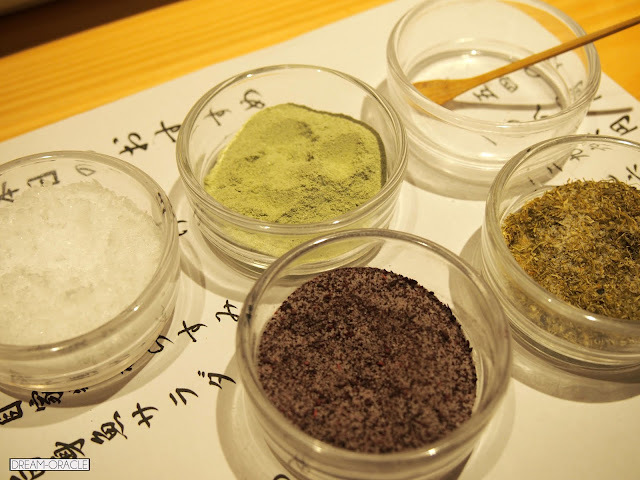 However at Tsunahachi, they've got (from left to right:) regular sea salt, wasabi salt, yukari shiso salt and seaweed salt. There is also a grated daikon, grated ume and daikon, and a tsuyu for you to dip your tempura into. My favourite dip is the purple yukari shiso salt and the pale pink ume daikon. After the refreshing cold tofu appetizer, we began the meal with a tempura prawn head and prawn. Prawn heads, to me, are usually a throwaway in most dishes. With the exception of maybe prawn noodle where it's useful for boiling the broth, I see no value in prawn heads. Until I had them in Japan. It was crispy and delicious, none of that slightly stinky fishy smell that prawn heads usually reek of. And the prawn, oh it's so fat and juicy. That little piece of tempura at the back is squid. Yes, you can tempura squid. It was one of the most delicious squid I've ever had. You know how squids tend to become a little tough if you overcook it? Not this. The chefs were real skillful, and beneath that crispy exterior lies a very Q piece of fresh squid. After my encounter with prawns and squid, I went on to savour fish tempura. I swear, you can tempura anythingggggg. They just don't seem to bother to tempura fish or squid here in Singapore. The fish was so fresh and sweet, soft and flaky. Don't worry about bones and all that, there's either none or they're so crispy that I ate them all without realizing. This pairs extremely well with the ume daikon as the slight sourish ume balances out the deep-fried fish and adds a tinge of flavour to it. 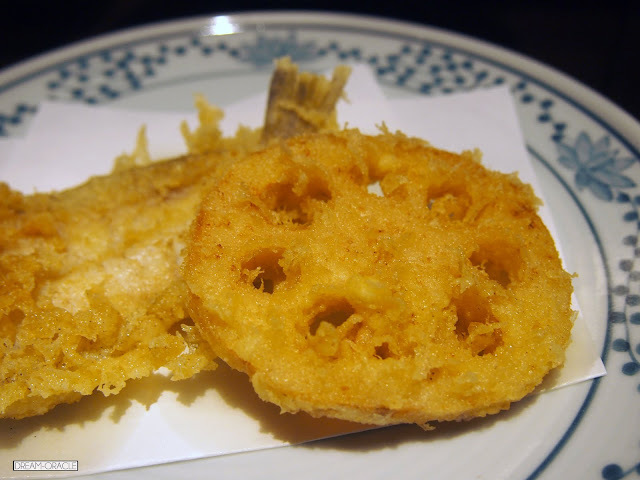 After the fish came some root vegetables, lotus root tempura is surprisingly sweet and crunchy. I'm hazarding a guess here but this does look and taste exactly like battered black fungus. It's actually extremely delicious, the black fungus takes on a rather interesting texture after it's deep fried. The anago is THE highlight of this course meal. 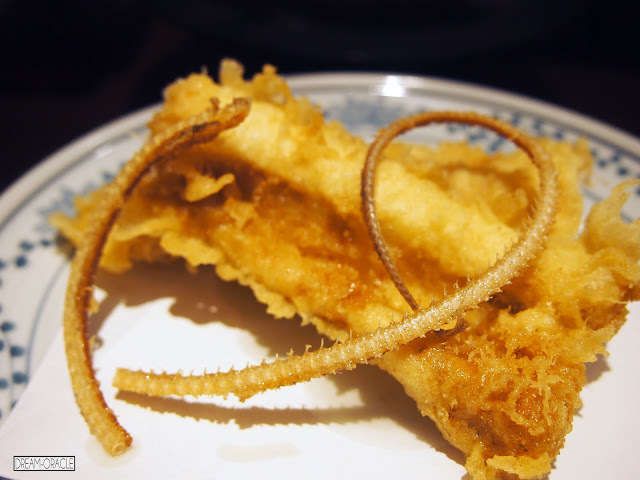 The spine of the anago is deep fried to a crisp and it's so addictive you can start popping them like chips. That's how good it is. The anago itself is fresh, flaky, sweet with a salty kick. Easily one of the best fish I've tasted in my life. It was extremely flavourful. Lastly, to finish up the meal, you get to choose between ochazuke or tendon. I've had tendon in other shops so I opted for ochazuke. Ochazuke is simply rice in green tea. So I was served this kakiage don and I doused green tea in it. It was light, refreshing, and a perfect way to end this hearty meal. 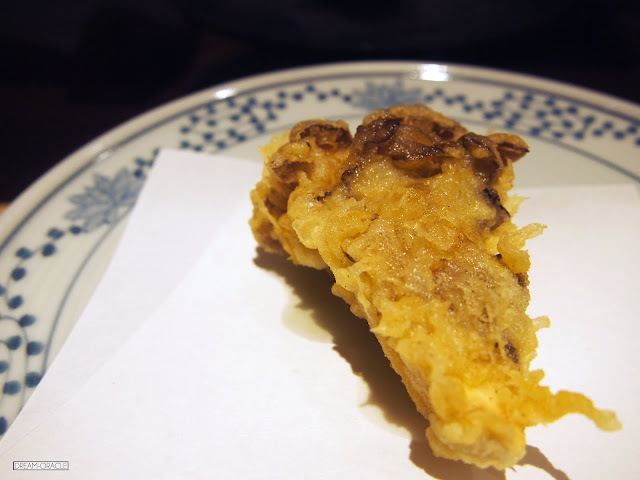 Despite all the deep-frying, their tempura is rather light and remarkably greaseless. My entire course adds up to around 3300 yen (SGD 38) and while it's not the cheapest meal, it is my most memorable and remarkable meal in Japan. 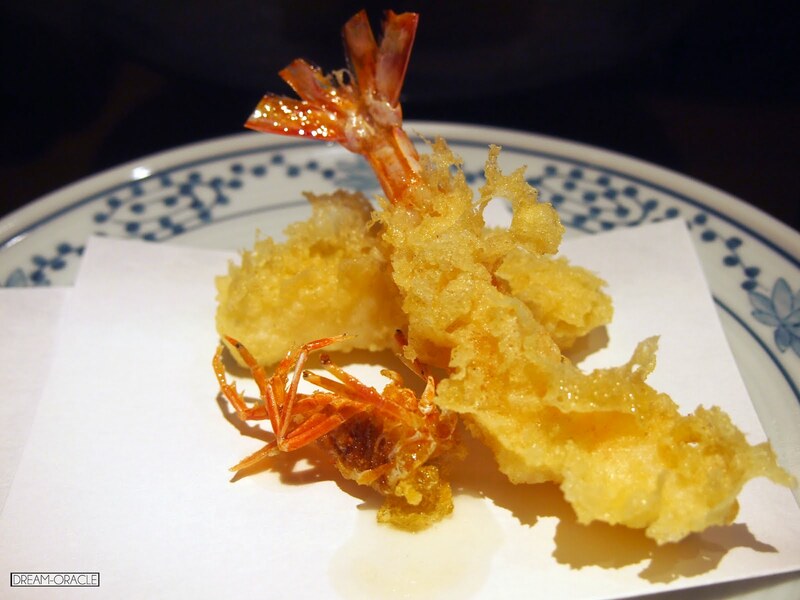 Even though some might say it's just tempura, trust me, this is not just any old tempura. I recommend you come for the dinner, opt for the counter seat and watch the chef whip up your dinner, piece by piece. If you can converse in Japanese, you can even interact with the chefs. They were the ones who told us the whiting fish pairs well with the ume daikon dip! I've read that in places like that, the lunch menu is cheaper. But I think travelling is also about the experience, so come for dinner and experience the whole interactive counter course meal. I am sure you will not regret it.